14 Nov 2016 --- Growing calls for transparency throughout the supply chain are taking clean & clear label to a new and supreme level. This comes as the inherent benefits of plant-based products are being active marketed to a more health conscious consumers. “Clean Supreme” and “Disruptive Green” lead Innova Market Insights’ Top Ten Trends list for 2017. The trends will be presented in a live webinar to be broadcast on November 22 (10am EST/4pm CET). “Interest in naturalness and clean label continues to feature strongly,” according to Lu Ann Williams, Director of Innovation at Innova Market Insights. Numerous consumer studies point to a clean label advantage Research from a recent pan-European consumer survey by the GNT Group found that two thirds of Europeans reach for crisps, nuts and savory nibbles at least once a week and 11% eat them as often as several times a day. The research also found out that not only the brand name and a low price, which interest 48% and 41% respectively, are important. Even though – or possibly because – crisps and the like are not the healthiest kind of snack to eat, natural ingredients are essential for more than one third of consumers (36%), and are actually even more important than the fat (34%) and calorie content (27%) or the organic status (11%). 47% of the Europeans try to avoid products containing additive colors as much as possible. Clean label is the new standard and 2016 has again been full of announcements around reformulation strategies. For example, Mars has announced that it will remove all artificial colors from its human food products as part of a commitment to meet evolving consumer preferences. By expanding the scope of the effort to its entire human food portfolio, Mars says it is making a commitment of significant depth and breadth. Products across the range of the company’s chocolate, gum, confection, food and drink businesses will be affected by the change, which will take place incrementally over the next five years. But we have gone beyond clean label alone, as consumer demand for authenticity and transparency is fueled by the demand for clear label launches. This marketing term, coined by Innova Market Insights in 2014, has been jumped upon by the industry, with even behemoths such as Danone [Dannon] adopting it in their marketing literature. While few of our trends relate to health specifically, it is important to note that many reformulations do have health in mind on the back of government pressure. The trend is already leading to challenges on the supply side, with difficulty in sourcing enough natural products to deal with the surge in demand. How to cope with the finite supply of materials such as Madagascar vanilla will be one of the key challenges for the future. Suppliers are already having to look beyond their base and grow in diverse regions of the world. This will be one of the key issues for the food industry going forward and present a future challenge should the ongoing trend to clean & clear label continue for years to come. Innova Market Insights has revealed its top trends likely to impact the food industry in 2017 from its ongoing analysis of key global developments in food and drinks launch activity worldwide. 1. Clean Supreme: The rules have been rewritten and clean and clear label is the new global standard. The demand for total transparency now incorporates the entire supply chain, as a clean label positioning becomes more holistic. 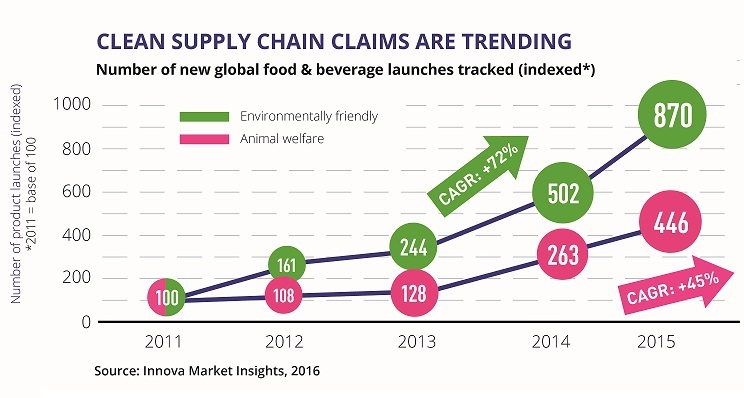 Trending clean supply chain claims include “environmentally friendly,” which has shown a CAGR growth of +72% from 2011-2015 and “animal welfare,” which has grown at +45% per year during this period. 2. Disruptive Green: As plant-based milks, meat alternatives and vegan offerings have rapidly moved into the Click to Enlargemainstream, consumers are looking for innovative options to take the inherent benefits of plants into their daily lives. Even dairy companies are now leveraging the functional and technical benefits of plants in new product development, driving more variety and excitement into their category. 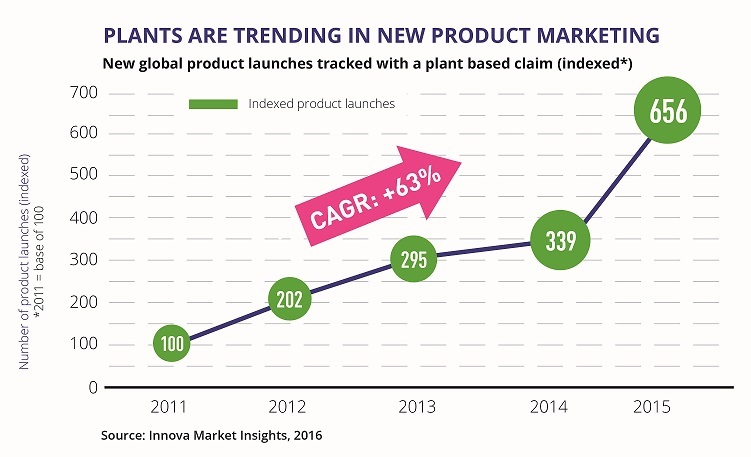 Innova Market Insights has reported CAGR of +63% for new product launches with a plant-based claim from 2011-2015. 3. Sweeter Balance: Sugar is under pressure, although it remains the key ingredient delivering the sweetness and great taste that consumers are looking for. The quest to combine taste and health is driving NPD, as the industry faces the challenge of balancing public demand to reduce added sugars and create indulgent experiences, while at the same time presenting clean label products. 4. Kitchen Symphony: Italian Lasagna is no longer enough – we want Melanzane Aubergine Al Forno! The connected world has led consumers of all ages to become more knowledgeable of other cultures. As a result, there is growing demand for greater choice and higher levels of authenticity in ethnic cuisines. At the same time, pride in local and regional foods is also seeing an upsurge in some countries, with a resulting rise in availability and authenticity of local cuisine. 5. 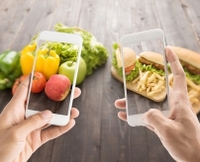 Body in Tune: Consumers are increasingly personalizing their own nutrition intake, making food choices based around what they think will make them feel better. They are also experimenting with free from products and specific diets like paleo and low FODMAP. At the same time, consumers continue to increase their intake of foods and beverages with ingredients that they consider to be healthy, like protein and probiotics. All of the top ten trends will be discussed in a live webinar to be broadcast on November 22. To register, click here.